Microsoft is officially beginning the rollout of the Windows 10 April 2018 Update (version 1803) on April 30, 2018. This is the fifth major release for compatible devices with new features and changes to improve security, privacy, performance, and productivity. In version 1803, you’ll find new features like Timeline, Nearby Sharing, and Graphics settings. Windows 10 continues the gradual rollout of Fluent Design in the Start menu, taskbar, Settings, and throughout the experience. Users get more control over their privacy, such as options to view and delete telemetry data and deny file access to apps. The Settings app receives a lot of tweaks, including a new section to manage fonts, Microsoft Edge gets updated, and a lot more. Get it go, select the Start button, then select Settings > Update & security > Windows Update. Select Check for updates. If updates are available, install them. But many people have some problem when the Windows 10 April 2018 Update. I have 2 pc, the one computer is very well when the Windows 10 1803 version update, it just took 35 minutes, but the other one computer almost crashes after the 1803 update then I find fixes to the most common problems in this guide. Windows 10 has a troubleshooter that can help identify any problems. If you found any question when you update windows 10 1803, you should try it at the first. To do this, click the Start menu, then click the cog icon on the left, which will open up the Settings window. Click ‘Update & Security’ then ‘Troubleshoot’. Click on ‘Windows Update’ then ‘Run the troubleshooter’ and follow the instructions, and click ‘Apply this fix’ if the troubleshooter finds a solution. Disable anti-virus software, If you have antivirus software installed, try disabling that before trying to install the Windows 10 April 2018 Update, as that may fix the problem. You should then enable it and use it normally once the installation has completed. If you are still experiencing problems when trying to install the Windows 10 April 2018 Update, then you may need to reset the update service and try again. To do this, open up the Command Prompt by typing in ‘CMD’ into the search bar and right-clicking on ‘Command Prompt’. Select ‘Run as administrator’. Before you start Windows 10 April 2018 update, it is better to have your current Windows 10 backed up in case that some issues can occur unexpectedly. 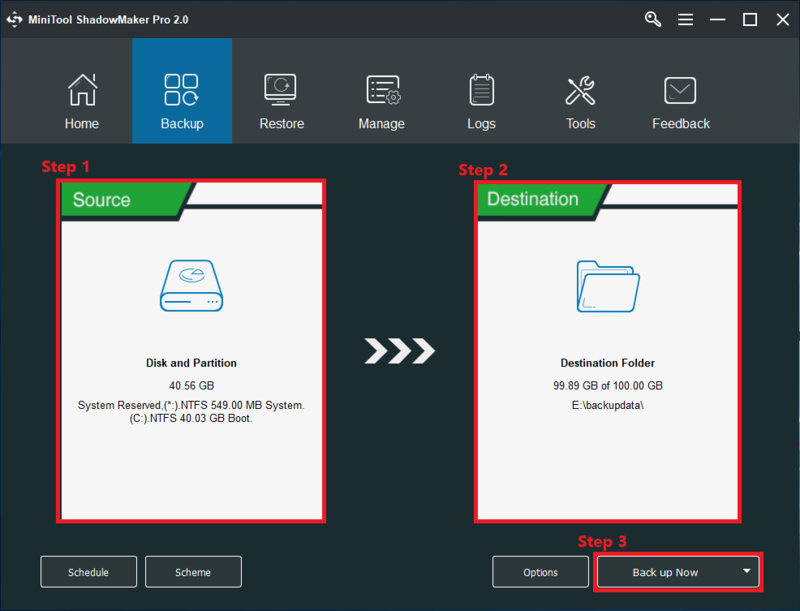 MiniTool ShadowMaker is recommended to help you make a regular backup for Windows operating system, files, and folders as well as disks and partitions. Besides, it makes schedule backup as easy as pie and offers flexible ways to manage disk space taken by backup image files. Users who are interested in this Windows backup software may just have a try. Tip: Install and Run MiniTool ShadowMaker, and then connect “This Computer” to enter the main interface. Step 1. Go to Backup where you can select what to back up and where to save the backup image files. You can definitely find that the system required partitions are already selected by default. But you can add more partitions on the same drive by entering Source -> Disk and Partitions. Step 2. Similarly, you will see a recommended destination path is selected. You can enter the Destination tab to change the path. Step 3. Click “Back up Now”. You will be lead to the Manage tab and the backup progress will be shown there. Tip: in the future days when using this Windows backup software, you will be able to set up daily/weekly/monthly backup by clicking “Schedule”. And, to manage disk space taken up by image files, go to “Scheme” and choose the way for management. Usually, incremental backup is selected for it is the most space-saving method. What’s more, you can enter “Options” to customize the backup file. It is wise to make a bootable rescue media in advance so that you have the way to go back to the previous Windows 10 no matter what happens. This should show you any problems that were encountered about the fix to the Windows 10 1803 April 2018 Update problems.